One of my productivity goals is to go paperless. I’ve been fairly successful in achieving my goal using tools like Evernote and Nozbe. One area where I’ve had trouble going paperless is when I brainstorm and plan my presentations and writing. I’ve tried many different tools to help me plan and organize my thoughts, and each has failed to work for me until I found Mindmeister. As a result, I’d like to share six reasons why iLove Mindmeister. The reason I decided to try Mindmeister was to test its ability to allow me to brainstorm electronically – it passed the test brilliantly. Mindmeister is flawless in its execution of brainstorming. It allows you to organize visually and reorganize your ideas and thoughts visually. An unintended benefit of my use of Mindmeister is its ability to create content for me. Well actually, it doesn’t create the content but as a result of its visual layout, it has allowed me to see connections and extend items that I previously didn’t think about before using Mindmeister. 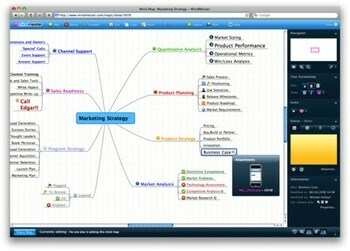 Mindmeister exists in the “cloud” and as such is available anywhere on any device – a huge plus for me. I access Mindmeister most often using the web interface but am increasing using the iPad App. I’ve accessed my Mindmeister Maps using my iPhone and while I wouldn’t recommend heavy usage using the iPhone it’s great to add to your maps on the go. If you read about the other tools that iLove, you’ll know that I’m partial to free tools, or at least tools that operate on the freemium model – Mindmeister is one such tool. I currently use the free option of Mindmeister, which limits you to three maps and limits your export options. I’ve been using Mindmeister for a few months now and am seriously considering upgrading to their basic option which will run you $4.99/month – a small price for unlimited maps, in my opinion. Another feature that takes Mindmeister to the next level is the ability to share your maps with friends and colleagues in order for you to collaborate on your brainstorming projects. The sharing feature allows you work online and gives you the ability to manage access to your maps be giving people access to edit or just view. While iLove the sharing feature I find the export feature just as useful. You can export your maps in many different formats including Mindmeister, FreeMind, MindManager, Microsoft Word, Document Outline, PDF, or as an image file. I’ve used this feature to share and backup maps. The final reason iLove Mindmeister is the fact that the tool is so easy to use and has a very small learning curve. I attribute this to the clean interface and design of Mindmeister. I’ve been using Mindmeister for some months now and created many different projects including presentations, webinars, the lead generation process for our admission office, and even this blog post. I encourage you to check it out MIndmeister and let me know what you think by posting your thoughts in the comments below. Brendam • glad I happened upon this article. Been tossing with XMind vs. MindMeister and since I’ve had you in my G+ Circle for awhile now, I know you know what you’re talking about. On the hunt for a “by the numbers” mindmeister map that incorporates the top tier SMM platforms w/ detailed tasks per social network so as to help define and automate as much as possible for the time strapped SMB.